Many other instances can be found—the distribution of crime amongst criminals, the distribution of accidents among hazardous processes, etc. Pareto’s principle of unequal distribution applied to distribution of wealth and to distribution of quality losses. In 1963, IBM discovered that about 80 per cent of a computer’s time is spent executing about 20 per cent of the operating code. There seems to be a natural, almost democratic, expectation that causes and results are generally equally balanced. The 80/20 Principle asserts that 20 per cent of products, or customers or employees, are really responsible for about 80 per cent of profits. If this is true—and detailed investigations usually confirm that some such very unbalanced pattern exists—the state of affairs implied is very far from being efficient or optimal. Probability theory tells us that it is virtually impossible for all the applications of the 80/20 Principle to occur randomly, as a freak of chance. We can only explain the principle by positing some deeper meaning or cause that lurks behind it. A great deal of what happens is unimportant and can be disregarded. In the early days of using a circular clock, if 51 per cent of clocks go what we now call ‘clockwise’ rather than ‘counter-clockwise’, this convention will become dominant, although clocks could just as logically have moved to the left. In fact, the clock over Florence cathedral moves counterclockwise and shows 24 hours.13Soon after 1442 when the cathedral was built, the authorities and clockmakers standardized on a 12-hour, ‘clockwise’ clock, because the majority of clocks had those features. A few things are important; most are not. Improving on nature, refusing to accept the status quo, is the route of all progress: evolutionary, scientific, social and personal. ‘The reasonable man adapts himself to the world. The unreasonable one persists in trying to adapt the world to himself. Therefore all progress depends on the unreasonable man. ‘But never read a book from cover to cover, except for pleasure. When you are working, find out what the book is saying much faster than you would by reading it through. Read the conclusion, then the introduction, then the conclusion again, then dip lightly into any interesting bits. It was better to be in the right place than to be smart and work hard. In US shopping malls it has been found that women (some 50 per cent of the population) account for 70 per cent of the dollar value of all purchases. Action resulting from 80/20 Thinking should lead us to get much more from much less. 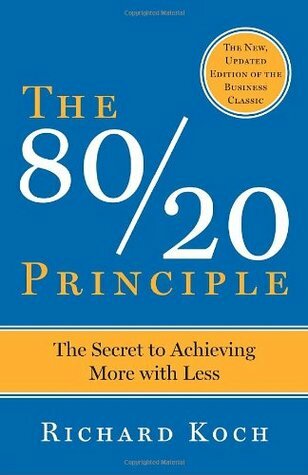 The 80/20 Principle was one of the key building blocks of the quality movement. Joseph Juran was the most enthusiastic messiah of the principle, although he called it ‘the Pareto Principle’ or ‘the Rule of the Vital Few’. The economist Pareto found that wealth was non-uniformly distributed in the same way. Many other instances can be found—the distribution of crime amongst criminals, the distribution of accidents among hazardous processes, etc. Pareto’s principle of unequal distribution applied to distribution of wealth and to distribution of quality losses. Think small. Don’t plan to the nth degree on the first day. The return on investment usually follows the 80/20 rule: 80 percent of the benefits will be found in the simplest 20 percent of the system, and the final 20 percent of the benefits will come from the most complex 80 percent of the system. Good software developers make high-use functions as simple and automatic and inevitable as possible. The art of using the 80/20 Principle is to identify which way the grain of reality is currently running and to exploit that as much as possible. In the next century only old fogies like me will prefer to deal with humans and even I will have my doubts. Innovation is the name of the game: it is absolutely crucial to future competitive advantage. Every few years a new competitor, such as Ikea in furniture, proves that there is new life in the very old idea of self-service. Additional scale, without additional complexity, will always give lower unit costs. Complexity slows down simple systems and requires the intervention of managers to deal with the new requirements. Simplicity raises prices as well as lowering costs. If your eye offends you, pluck it out! Just remove the offending overhead. If your will is strong, you can always do it. What is most simple and standardized is hugely more productive and cost effective than what is complex. Always try to identify the simplest 20 per cent of anything. Cultivate it. Whenever something has become complex, simplify it; if you cannot, eliminate it. The road to hell is paved with the pursuit of volume. Complexity is stimulating and intellectually challenging; it leavens boring routine; and it creates interesting jobs for managers. The war is between the trivial many and the vital few. Most activity results in little value and little change. We miss both the garbage and the gems. The way to create something great is to create something simple. Progress requires simplicity; and simplicity requires ruthlessness. Customers could have his Model T in any color as long as it’s black. The mission to simplify goods and lower their cost, while making them more attractive, is the foundation for today’s wealthy consumer society. Henry Ford: democratize the automobile. At the time, the goal was laughable: only rich people had cars. Nobody in the nineteenth century would have wanted frozen food, because there were no freezers to keep it in. All innovation is necessarily product led. You cannot innovate without a new product or service. Successful marketing is all about a focus on the relatively small number of customers who are the most active in consuming your product or service. Only train those who you are reasonably sure plan to stick around with you for several years. Most activity is a waste of time. It will not contribute materially to desired results. Not many decisions are very important. Turning points have come and Gove without being recognized. A project is several projects. Desperate situations inspire creative solutions. Impatient people don’t make good negotiators. The best people generate enormous surpluses, usually far beyond what they are allowed to take out. A few employees are priceless. They add value far beyond their cost. Many employees are passengers adding much less value than they cost. Waste and idleness gravitate to where complexity and democracy meet. In large firms the top performers get less than they should and the mass of mediocre managers end up with more than they deserve. Behind luck there is always a highly effective mechanism, generating surpluses regardless of our failure to notice it. Successful innovation is hugely more productive than the status quo; it has to be, to overcome it. Personal success resides not in invention, or even in creating the marketable innovation, but in spotting the point at which the innovation is about to become irresistible and then riding it for all it is worth. Change is necessary for survival. Look for the invisible 20 per cent. It’s there — find it. Most people do not do the simple thing that would be conducive to their happiness, even when they know what they are. It is the triumph of guilt over joy, of genetics over intelligence or predestination over choice and, in a very real sense, of death over life. It is very difficult, and always wasteful, to achieve something worthwhile without enjoying it. If we did not believe in the possibility of progress, we could never change the world for the better. We have more than enough time. Insight comes when we are feeling relaxed and good about ourselves. Happiness, like the mind, will atrophy if not exercised. There is a profound imbalance between what is created and the time taken to create it. They become addicted to time management, but it doesn’t fundamentally change what they do, or significantly lower their level of guilt that they are not doing enough. Society is divided into those who have money but no time to enjoy it and those who have time but no money. It is not shortage of time that should worry us, but the tendency for the majority of time to be spent in low-quality ways. The trouble is that we do enjoy hard work. You will not create anything of enduring values unless you love creating it. I suspect that most people try too hard at most things. The modern world would greatly benefit if a lower quantity of work led to a greater profusion of creativity and intelligence. Do not follow the herd. It may be that you will be the happiest in the rat race; perhaps, like me, you are basically a rat. Sadly, Hitler was one of the century’s best and most charismatic actors. Once in your profession, if making money is really important to you and if you are any good at what you do, you should aim to become self-employed as soon as possible and, after that, to start to employ others. The best people are always underpaid and the worst people always overpaid. Save and invest. This is what capitalism is all about. Once you have adjusted to a higher standard of living, it may give you little or no extra happiness. Apparently, the common pattern of people in any society is to have two important childhood friends, two significant adult friends and two doctors. Typically, there are two powerful sexual partners who eclipse the others. Jesus Christ depended on John the Baptist to draw him to public attention; then on the 12 disciples; then on other apostles, notably St Paul, arguably the greatest marketing genius in history. History is determined and changed by dedicated individuals who form effective alliances with a small number of close collaborators. You may have no hope of becoming Albert Einstein or even Bill Gates, but there are literally hundreds of thousands, if not millions, of niches where you can choose to specialize. Everyone is excited by something; if not, they are dead or dying. You have to know more than anybody else, at least about something. Are you going to invent the product, to add value to someone else’s semi-finished product or to be a retailer of finished products? The winners in any field have, almost by definitions, found ways to make 20 per cent of effort yield 80 per cent of results. Leaders are usually outsiders; they think and feel differently. Karl Marx’s theory of surplus value states the the workers produce all value and excess value is appropriated by the capitalists who employ the workers. Put crudely, profits are the excess value stolen from the workers. The best use of wealth is usually to create a new lifestyle where you can choose how to spend your time, to pursue a career or work activity that you would most enjoy. Then the investment period is over. It is sensible to stand back from careers and money making and consider the most important subject of an: happiness. Human beings are not entirely like other animals. All other creatures have a definite nature that they cannot change. Humans have been given an indefinite nature and thus the ability to mould themselves. The rest of creation is passive; humans alone have an active nature. They were create; we could create. When unhappiness strikes, we can recognize what is happening to us and refuse to accept it. Jean-Jacques Rousseau: man is everywhere in chains yet everywhere can be free. Optimism, it seems, is a medically approved ingredient for both success and happiness; and the greatest motivator on earth. Your feeling of being unsuccessful limits your success and your happiness. Richard Nixon ended the Vietnam War by declaring that America’s objectives had been achieved. Use all the willpower at your disposal to make yourself happy. Construct the right stories about yourself—and believe them! the real chemistry can occur in fleeting seconds, so that you feel 99 per cent of the attraction in 1 per cent of the time and you know at once that this is the person for you!